Following Vodacom’s launch of a commercial 5G network in Lesotho last year, a roll-out of the high-speed network in South Africa has received a huge boost after Rain (a data-only telecoms firm) announced plans to extend the network commercially in September. The company is partnering with Chinese telecoms hardware manufacturing giant Huawei, which will supply the devices necessary for consumers to enjoy the new, high-speed mobile standard. Rain and Huawei made the announcement at the 2019 Mobile World Congress in Barcelona (Spain) where 5G took centre stage. The roll-out will further solidify South Africa’s place as one of the first countries in the world to spread out the network, which promises faster download speeds, reliable network connectivity and the ability to connect more devices at once. Rain plans to roll out the network rapidly, aiming for significant coverage in metropolitan areas initially. “We hope to have rolled out a significant number of towers in [Cape Town, Johannesburg and Durban] by mid-2019 to offer commercial services to clients,” Rain CEO Willem Roos revealed. With about 3,000 4G sites already in South Africa, the company plans to add 1,000 5G sites in major cities over the next two years. “Rain is very optimistic about the business prospects of South Africa’s 5G network and will continue to invest more in 5G networks and better serve users,” he added. Apart from deploying new base stations, Huawei’s solutions will enable Rain to fully leverage its existing Long Term Evolution (LTE) infrastructure and allocated spectrum for 5G deployment. This approach of sharing facilities and leveraging existing infrastructure will enable Rain to roll out the network in a quick and cost-effective manner. “The network will provide fibre-like speeds without installation complexities, time delays and cost of laying fibre in underserviced areas,” Roos said. According to Roos, the company is looking forward to bringing fast wireless access to many more South Africans, bridging the digital divide and making South Africa a better place for everybody to live in. A report by GSMA shows that 5G would account for 15 percent of global mobile connections by 2025. “It is well known that if broadband penetration increases in a country then you get better economic growth and then you see improvement in employment and Rain can play a small part to help bridge the digital divide in our country. We are big supporters of our president [Cyril Ramaphosa’s] recent initiatives to re-energise investment in our country,” he added. 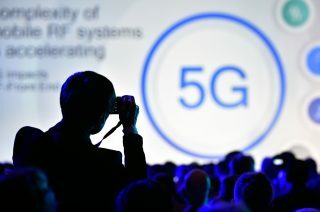 “The arrival of 5G forms a major part of the world’s move towards an era of intelligent connectivity, which alongside developments in the Internet of Things, big data and artificial intelligence, is poised to be a key driver of economic growth over the coming years,” GSMA Director-General, Mats Granryd said. At the event, Huawei launched its full range of 5G end-to-end product solutions, from the core network, bearer network and base stations to terminals. Huawei also showcased its 5G foldable smartphone, the HUAWEI Mate X; and the HUAWEI 5G CPE (Customer Premise Equipment) Pro. These products deliver outstanding high-speed connectivity and bring a hyper-connected, all-scenario experience closer.